What started out as an eagerly anticipated road trip to our hunting camp ended up as something that would’ve made even Alfred Hitchcock shudder. That’s the way things often roll for the Deerslayer clan. “What doesn’t kill us makes us stronger.” “God never gives us more than we can handle”. Well, we must be pretty damned strong by this point ‘cuz we’re not dead yet. It’s the reason that Deerslayer always brings every tool he owns on any road trip, and several changes of clothes and a roll of toilet paper…. because you “just never know when you might need these things”. I no longer question his logic because God has determined that we can handle quite a bit. I used to scoff. I would complain that we really needed to pack lighter for an overnight trip. Over the years, however, after several blowouts on the camper on a single trip, unfortunate spills, dangerous burritos, rolling a pick-up truck on black ice, and rattlesnakes, I learned to trust my Deerslayer’s judgement in the matter of packing for trips. The full extent of the bee situation wasn’t captured at the time. Abject fear prevented me from grabbing the camera at that moment! This is just a small remnant of what we encountered. Even our “worst case scenario” packing strategy didn’t prepare us for what we encountered upon arrival to our hunting camp, after an eight-hour drive. We got to the camp about 10:00 at night. We opened the door of our camper, ready to make the bed and fall into it. The floor was covered with something, though, something that crunched when we stepped on it. Remember the part in “Indiana Jones and the Temple of Doom” where there was a sickening crunching sound as Indy and Short Round cautiously walked through the cave? It was like that…. Except it was BEES! About an inch deep and smelled like dead bees! I have to admit that, prior to this encounter, I’m pretty sure that I would not be able to tell you what dead bees smelled like. Sadly, I’ll never forget! I’m not sure what made me wade in with a broom into a situation that, at this point, hadn’t been assessed to any degree, and start sweeping frantically. It’s what I do. It’s not like I was able to put any kind of dent in the layer of death and stink. We were too tired to think about anything except sleep at that point but we DID realize that stepping on dead bees or live ones bare-footed would result in a sting. What we didn’t realize was that, as we waded through the dead bees, we were stirring up the thousands of live ones that were inside the wall of the bathroom. There was a buzzing that was faint at first, then grew increasingly louder By the time we had a firm grasp of the situation (that there were LIVE bees, and that it was a possibility that they could be Africanized) we were scrambling to get out. Our only saving grace, at this point, was that it was dark out and the temperature was lower than 40 degrees which slowed the bees down considerably. This is our romantic nest the next morning. We slept under a moon and stars that were so bright we almost couldn’t sleep and listened to coyotes and wild pigs at the pond. A decision was made at this point to grab everything we had already brought in and hightail it out muy pronto. Deerslayer decided to grab our memory foam mattress which had stiffened with the cold and refused to budge. Once again, I questioned the logic. While I’m known for being laid back, cool under pressure, and flexible in all circumstances (NOT), Deerslayer was not able to detect that I was beginning to freak out about the bees, dead and alive, with my Epi-pen at the ready. After much work we got the mattress out without any swarming and threw it into the back of pickup. 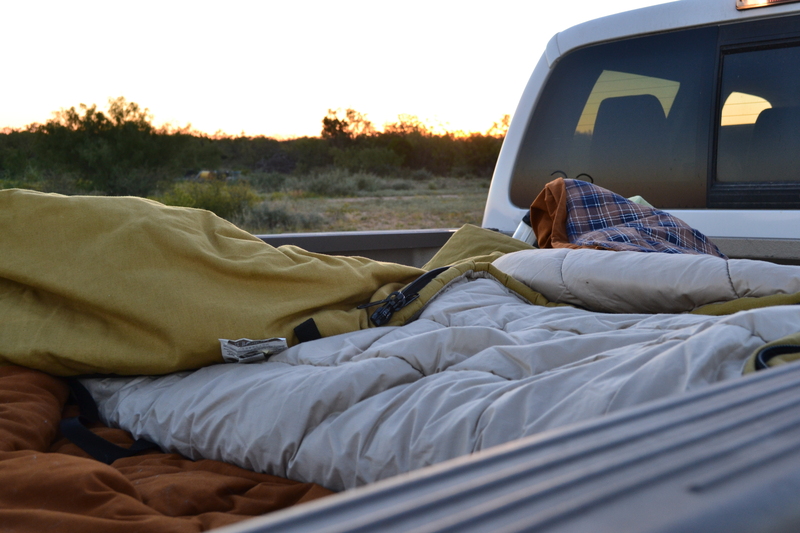 We drove about 100 yards away from the bee sanctuary, covered the mattress with sleeping bags, and attempted to sleep out-of-doors, in nature, as it were. Now, I may be the wife of a deerslayer, one who cooks wild game with gusto, camps in a camper, and sips wine at the campfire. But this outing was the first of its kind for me. If I hadn’t been covered in bee residue (and afraid) it would’ve been very romantic. I have to admit that I passed up an opportunity. God never gives us more than we can handle! As of this moment, we have not resolved the bee issue. I’ll keep you posted. I’m cackling like an idiot, I hope you know. Just one more service I provide! I would laugh, but I’m so afraid of bees that your story made my heart race. And I’m not even allergic to them! Sweet heavens, I wouldn’t even know where to begin with that. Something smoky, and lots and lots of Raid. It’s how my dad got rid of a paper wasp nest in our yard when I was a kid. Try calling a beekeeper or look up local apiarists. They might be able to help you remove the bees and not kill any more of them. I’m sorry they scared you. 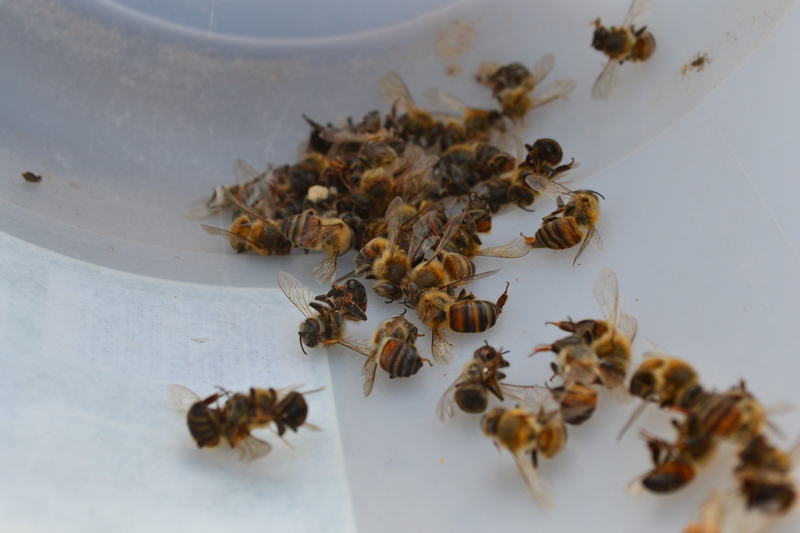 With the struggling honey bee populations out there, I hope you can find it in your hearts to try and save them. I’m not positive on this, but I believe Africanized bees are not very cold hardy. I know that regular honeys aren’t either, but they can get very grumpy if you open their nest in the cold weather. Be safe and good luck with the hunting as well. You are so brave to venture anywhere near the bees!! That sounds like my worst nightmare and I think you were much calmer than I would have been. At one point my house had bees nest in an outside wall and get inside… one morning I woke up when I rolled over on my pillow and got stung in the face! Needless to say, not fun. Thankfully, the bees have been gone for quite some time but they still scare me. Good luck de-beeing!